Marketers have the ability to add Additional Files/Links to their Opportunities. These Files/Links are supplemental and are not meant to replace the requirements for your post. 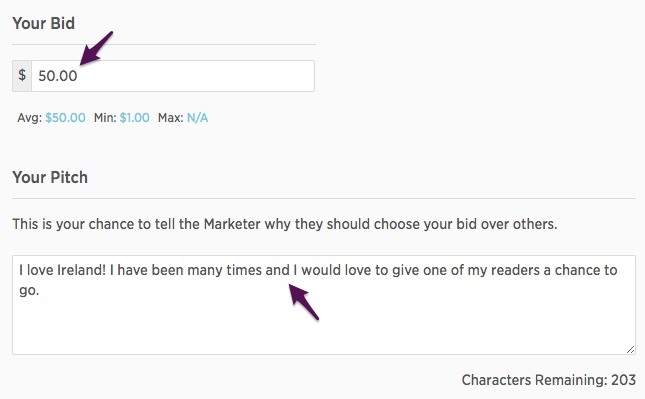 Files/Links can be hidden by the Marketer during the bidding process to protect information that they do not want to share with you until the negotiations are completed. These Files/Links can be Campaign Briefs, coupons, photos etc. 3. Once on the Bidding page, you will see your Overview, Requirements and any Files attached to the Opportunity. The Files tab will only appear if a Marketer has attached files to the Opportunity. If there is not a Files tab, then you do not need to review any additional files. 4. Once on the Files tab, you can view the provided Files and Links by selecting View. The files will then be downloaded for you to view. 5. If any of the Files have been made private by the Marketer you will see this blue box above your other Files/Links. These Files will become available to you once you and the Marketer have agreed on terms and completed the bidding process. 6. Once you have viewed the files it is now time to enter your bid and pitch for the Marketer. The bid price is the amount you wish to be paid for your content. Your Pitch is your chance to stand out from other Creators by telling the Marketer exactly why you should be chosen for their Campaign. Please do not include things that the Marketer can already see, like your follower count, you will instead want to provide them with a reason your connection is a perfect fit for the Campaign. 7. In order to place your Bid, you must remember to read and agree to the Terms and Conditions. If you do not check this box you will not be able to submit your Bid. 8. Once you have agreed to the Terms and Conditions don't forget to submit your Bid or save it as a draft if you need to come back to it. 9. Once successfully submitted, you will see the opportunity under the Pending tab on your dashboard. Remember that bidding on an Opportunity does not guarantee that the Marketer will accept it. The Marketer may also choose to negotiate with you on price. You always have the option of accepting, countering, or declining their offer.